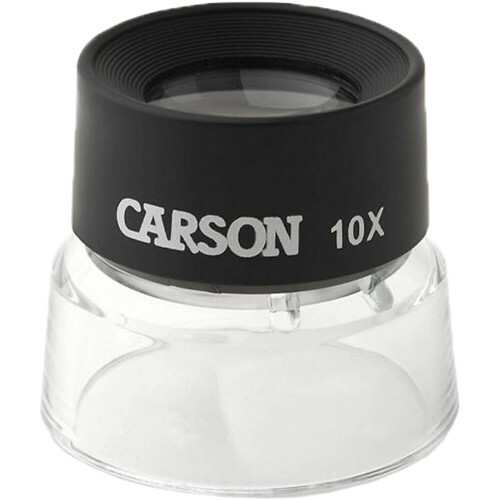 The LumiLoupe 10x Magnifier from Carson Optical helps you examine small objects such as coins, stamps and miniatures. The handy acrylic base uses ambient light to illuminate your subject. The pre-focused dual lenses allow you to see the fine detail on objects that would ordinarily not be visible. Box Dimensions (LxWxH) 2.2 x 2.15 x 1.95"
LL-10 10x LumiLoupe Craft Loupe is rated 4.5 out of 5 by 69. Rated 3 out of 5 by pure silverist from Slightly out of focus Given this loupe has such a high magnification power, the depth of field is very narrow (probably <0.5mm). This means if the loupe's lens isn't perfectly aligned in its carrier, that the optimal plane for the object will not be coplanar with the bottom perimeter of the loupe. This is the case with the one I purchased - it is slightly out of focus. 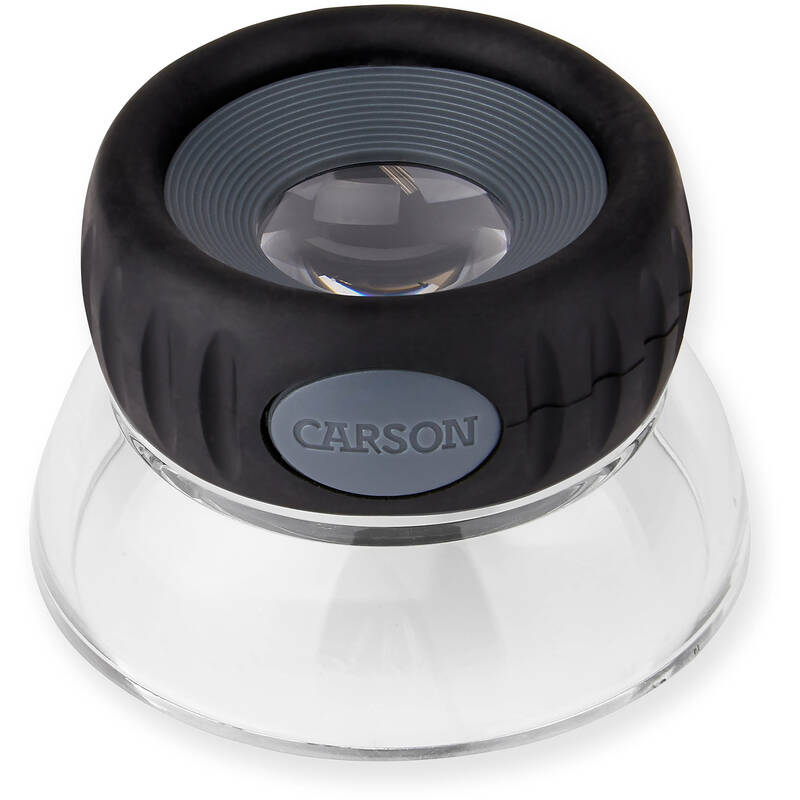 You can check this out for yourself by placing a hair on a piece of clear sticky tape and sticking the tape tightly across the loupe's base in the field of view. By pushing the tape up or down you'll see it come more clearly in to focus if it wasn't already. Rated 5 out of 5 by Orfeas S. from a fine piece of tool! used it to look at the 35mm negatives and contact sheets. it is very good to look at the details, however if you need to look at the whole frame i would recommend 5x loupe. in any case great tool! Rated 5 out of 5 by Markmesiya from Great Loupe! This Loupe is absolutely perfect for reviewing contact sheets. I originally used a jeweler's loupe but that became tiring as I could not place it down on my print, and enough light wouldn't reach the print either. This design allows for maximum light, and the optics are great. It also feels very solid and won't break anytime in the near future. It's already gone through a lot of abuse and looks as if I just took it out of the box today! Rated 4 out of 5 by NAH from Good for LF camera Great for large format photography for critical focusing on the ground glass, Inexpensive, all plastic. Only issue is the image focus outside the center of the field of view is fuzzy, but still perfectly usable. Nice and light weight for dragging it though the field. Rated 4 out of 5 by Ben from Great value! I was pleasantly surprised when I received the loupe. It is large and well made. It is made so that there is plenty of light to see the target area. The focus is very good in the center of the viewing area but falls off toward the edges (4 stars instead of 5). It works well for viewing photos as well as any other object that you want to view close up. It is a fantastic value for the money. I am completely satisfied and would not hesitate to recommend its purchase to a friend. Rated 4 out of 5 by light city from Great value for the price This inexpensive loupe has a generous size and I find it useful for being out in the field with my 4x5 camera. It's perfect for focussing on the groundglass and i'm not worried about dropping it. Rated 5 out of 5 by Ely from Bargain!!! Good product at a great price. I am able to see the details in my negatives. Definitely happy with my purchase because of the quality at a great price. Others in my class bought more expensive ones and wish they would have known about this one. Rated 5 out of 5 by Chris Etzel from Nice magnification, clear lens, great value I use this product to view negatives. It works very well. I can see really fine detail, and detect scratches before they make their way to the scanner.